The congress will take place in the conference centre at Croke Park. Croke Park is the headquarters of the GAA (Gaelic Athletic Association), the organisation responsible for the Irish national sports of Gaelic football and hurling. Croke Park has played host to iconic moments in Irish sport & history and to major cultural and international events. Since 1884 the site has been used primarily by the GAA to host Gaelic games, most notably the annual All-Ireland finals in football and hurling. In addition, both the opening and closing ceremonies of the 2003 Special Olympics, as well as numerous music concerts by major international acts, have been held in the stadium. During the reconstruction of the Aviva Stadium, Croke Park hosted games played by the Ireland national rugby union team and the Republic of Ireland national football team. Both the DART and LUAS networks provide an excellent service from many different parts of Dublin. In most cases ‘park & ride’ is available at various stations along the route. Take the Luas Red Line to Connolly Station and Croke Park is just a 15 minute walk from here. Iarnród Éireann provides convenient travel services for anyone travelling to Croke Park from rail connected locations around the country. For further information, visit www.irishrail.ie. Those who expect to use public transport often are advised to use a Leap card which can be purchased at many convenience stores (see www.leapcard.ie). These can be used on both buses and trains (including DART and LUAS). They can be ‘topped up’ in stores, at train stations or at LUAS stops. For buses, inform the driver of the required destination; for trains, just ‘tag on’ at the start and ‘tag off’ at the end of the journey. If using the buses without a Leap card, the exact fare is required as no change is given. Notes are not accepted for payment on buses. In short, a Leap card is convenient – and cheaper. The conference centre at Croke Park is conveniently located close to both the city centre and Dublin airport. A map is available here, and another one below. Anyone driving to the congress will be able to avail of free car-parking at Croke Park. The congress will take place in the Hogan Suite, the premier meeting spaces in Croke Park. The congress venue is wheelchair accessible. The congress venue has a business centre and also has Wi-Fi throughout. Car parking is available to all participants in the Davin Car Park. Click here for directions & map. Parking is free of charge and the car park is open from 7am until 7pm daily. Further information on the congress venue is available here. The GAA Museum celebrates Ireland’s unique national games of hurling and Gaelic football. 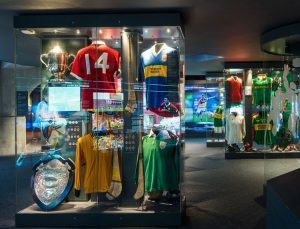 The museum’s exhibition galleries vividly illustrate the rich history and development of Gaelic games from ancient times to the present day and highlight the significant contribution the GAA has made – and continues to make – to Ireland’s cultural, social and sporting heritage since its foundation in 1884. Further information including admission fees and opening hours are available here. Visit Croke Park Stadium and find out what being Irish is all about! Croke Park is an iconic stadium, steeped in history, and has been at the heart of Irish sporting and cultural life for over 100 years. Take a trip here and enjoy an unrivalled state-of-the-art interactive visitor experience. You will also find out more about Ireland’s unique national games and learn about the fastest field game in the world – hurling! Further information including admission fees and opening hours are available here. 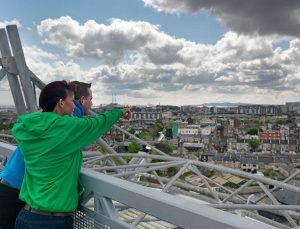 What better way to see Dublin, Ireland’s vibrant and dynamic capital city, than from 17 stories high on the roof of Ireland’s most famous sporting arena? The Etihad Skyline tour at Croke Park, offers visitors unmatched panoramic city views and insights into Dublin’s celebrated landmarks combined with the thrill of walking on top of one of Europe’s largest stadiums. Learn about Dublin’s history in this unique experience that’s not for the faint hearted! Further information including admission fees and opening hours are available here.